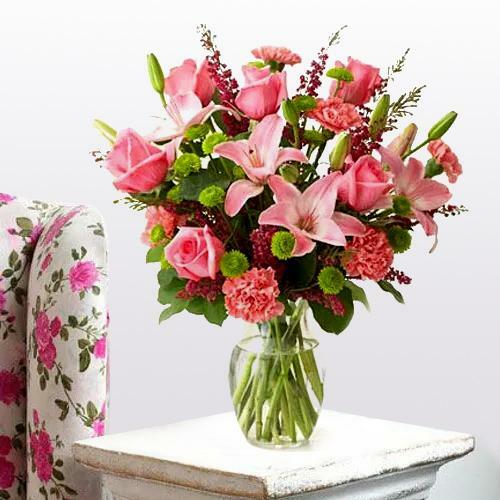 Convey your special wishes with this Pretty Arrangement of Lilies, Roses and Carnations with �Pure Passion as you enhance happiness in the lives of other people. Exclusive Arrg of Lilies, Roses and Carnations and Assorted Cadburys Chocolate. Exclusive Arrg of Lilies, Roses and Carnations with 500 grms Assorted Sweets. Exclusive Arrg of Lilies, Roses and Carnations with 16 pcs Ferrero Rocher chocolate box.